By Joe Gilberto. Release October 20th, 1988. 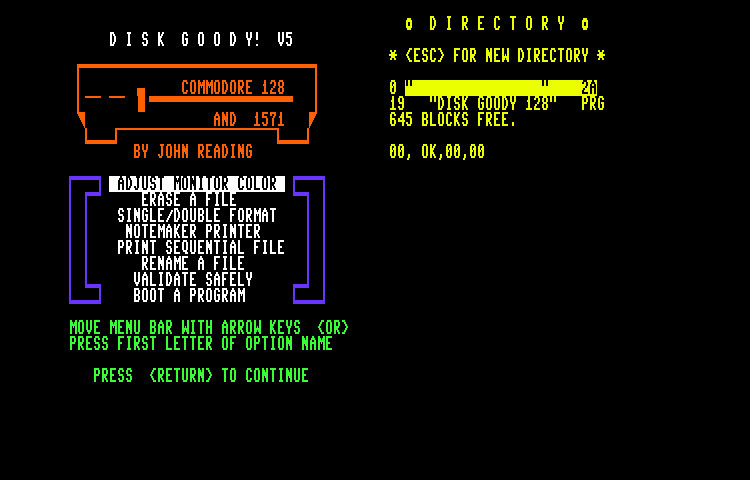 This utility appear to handle some basic housekeeping tasks for a 1581. It can create sub directories and read seq. files among other things. Help is built into the program. 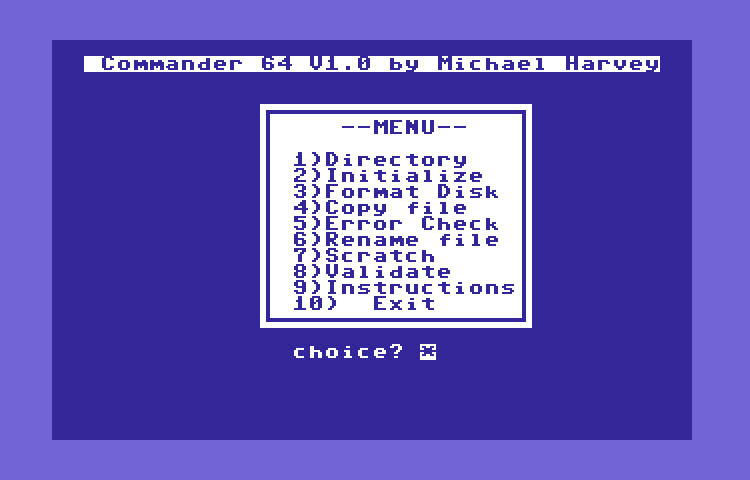 Written by Michael Harvey, Commander 64 is a straight forward disk utility with multiple functions such as format disk, copy files, check for errors, scratch files, validate disk, etc... instructions are built into the program. Disk Ease is your standard multi function disk tool with features such as directory sorting, disk error check, program merging, file copy and more. By John Reading. Features: Adjust monitor color, erase a file, single/double format, notemaker printer, print seq. file, rename file, validate safely, boot a program. 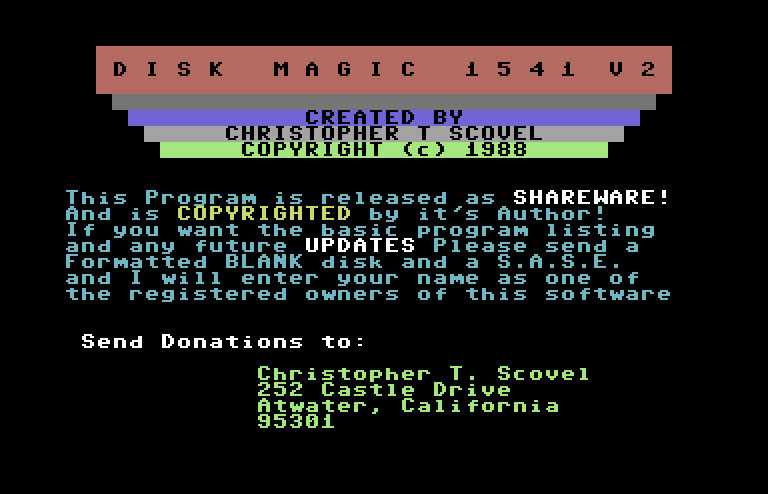 Disk Magic 1541 was created by Christopher T. Scovel and released in 1988. 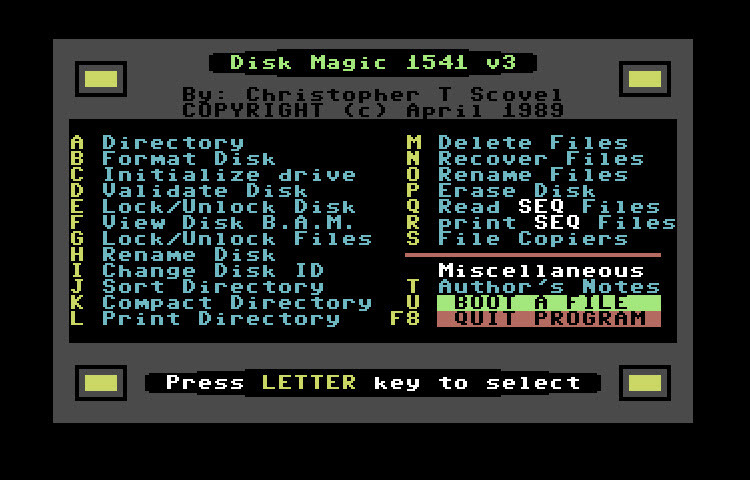 This program is full of great utilities for dealing with floppies on the 1541 disk drive. Released April 1989 by Christopher T. Scovel. 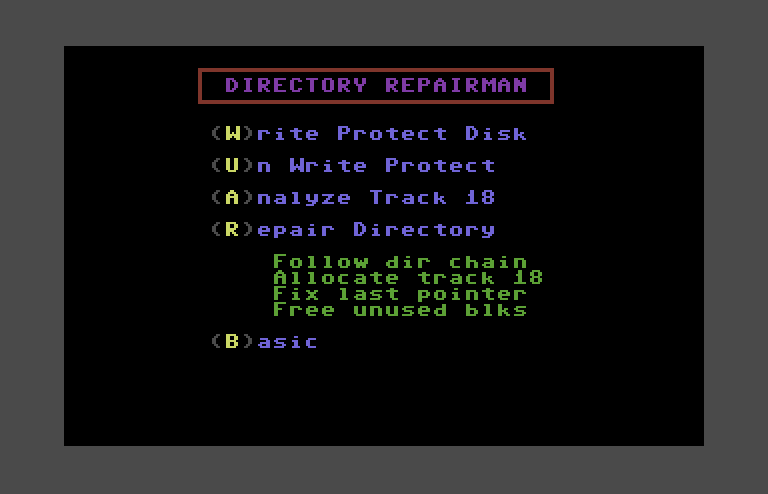 This nice utility has a utility for just about every disk related chore you might have. Docs are on the disk, but the screenshot pretty much sums it up. Written by David Stewart (Cooldaddy) - Diskmate is a multi-function disk tool that can format a disk, validate a disk, view an seq file, erase files, hide a directory and zero out files. Docs built into program. basic memory space. 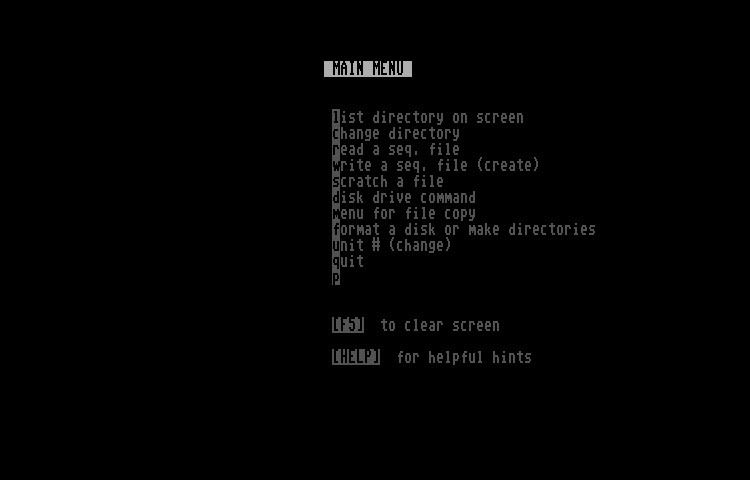 I also wanted to be able to use abbreviated DOS commands. the command that follows should be turned over to the wedge interpreter. 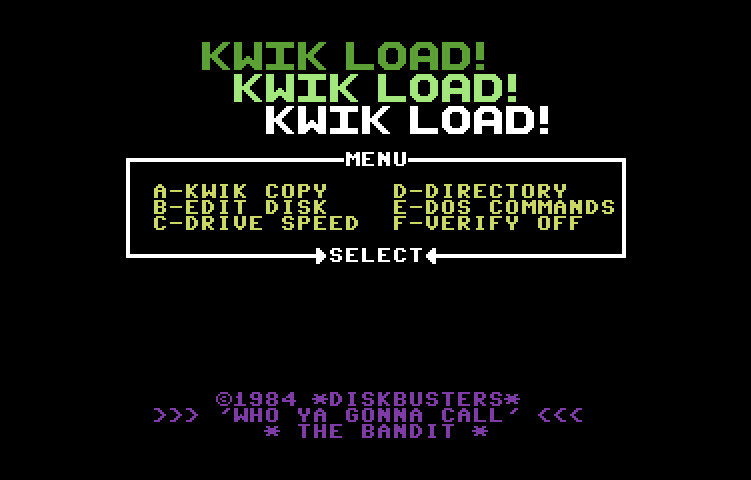 Disk Whiz is an easy-to-use disk housekeeping system for the Commodore 128 that performs operations on a single file or group of files. Help is built-into the program. By Bob Marquis. This utility does multiple things such as format disk, initialize drive, validate disk, rename file, etc... but the one thing that stood out was the ability to join two seq files. 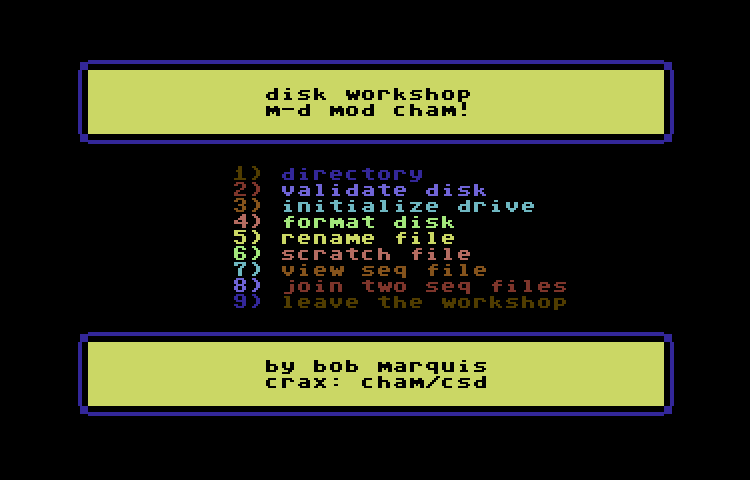 This is a moded version of Disk Workshop by CSD. Multi drive support has been added as well as some relative file functions. 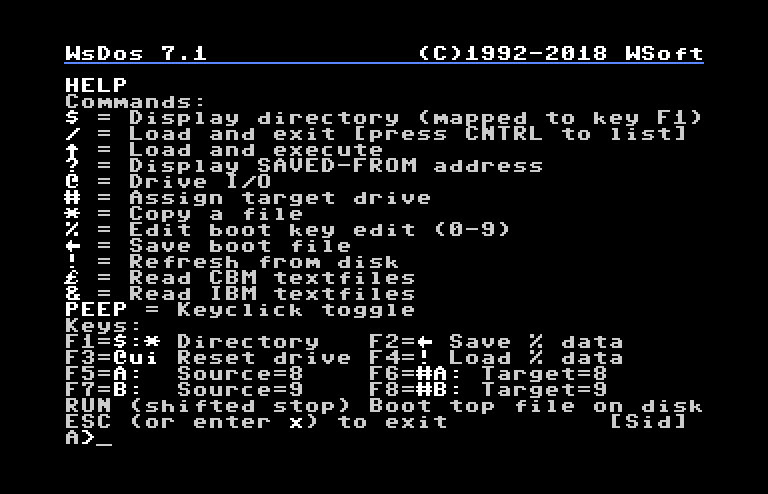 DOS in BASIC is a simple BASIC program that displays a directory and then lets you load, run, scratch, rename or copy a file from the displayed directory. Format-Editor is a multi-purpose disk tool that can: check a disk for errors, check a single track for errors, write protect a disk, un-write protect a disk, rewrite the BAM, create error, repair a track, format a disk and issue disk commands. 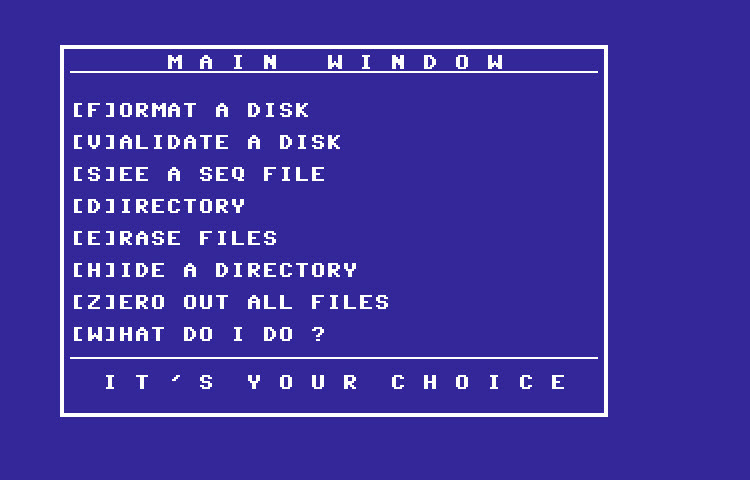 Help DOS v1.0 by Titan is just a small little program that can format a disk, scratch a file, rename a file and validate a disk. The best feature of this program is the cool font it uses. This cool little utility is mis-named in my opinion. Not only is it a file copier, it is also a disk editor and drive speed checker. I don't believe it actually has any quickload feature at all. 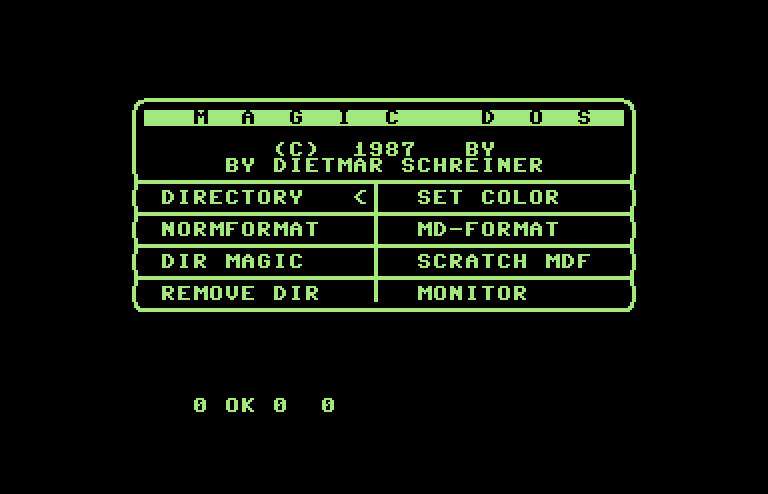 Magic Dos by Dietmar Schreiner was released in 1987. Although this multi-function tool only handles the usual DOS chores, it has a nice clean interface. Written by Dr. Midnight. This handy utility kit has just about everything you could need for disk / file / programming jobs. Take a look at the screen shot to get an idea of all the features. 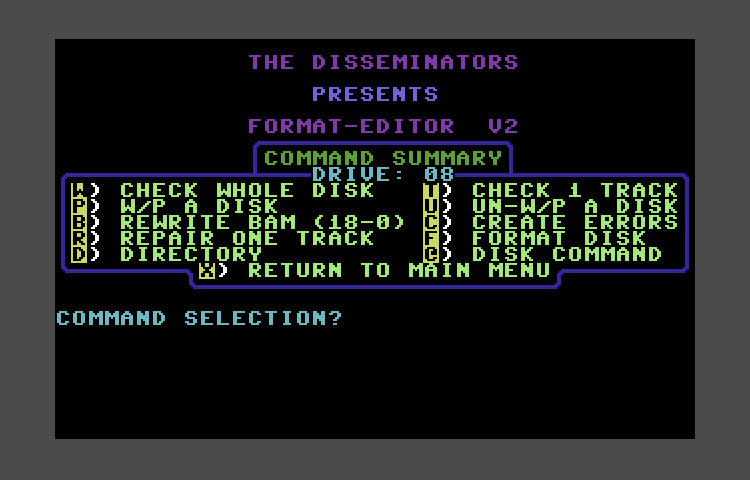 There are also Docs on the disk. 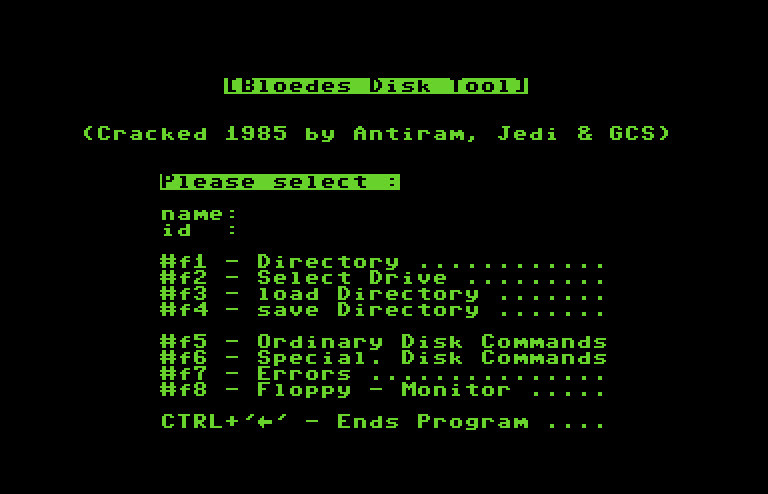 Pirate's Toolbox v3.5b is a nice collection of tools for doing just about anything to a disk. NOTE: Not all of the modules seem to work, but most do. 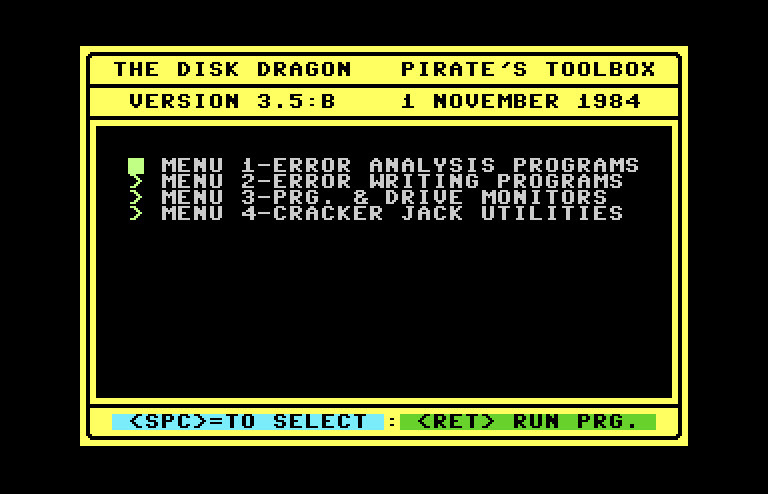 I have looked at many copies of Pirate's Toolbox, and this is the only one that was mostly working. 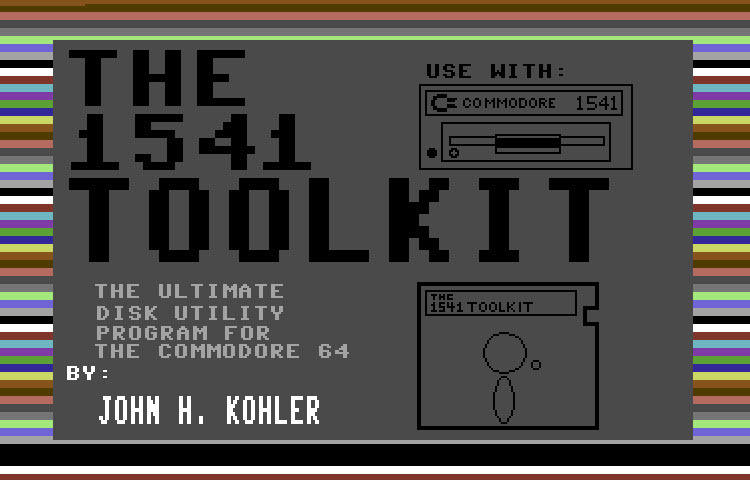 A complete utilities package for the 1581 disk drive and Commodore 64. - Copy whole disks from 1541 or 1571 format to 1581 partitions. 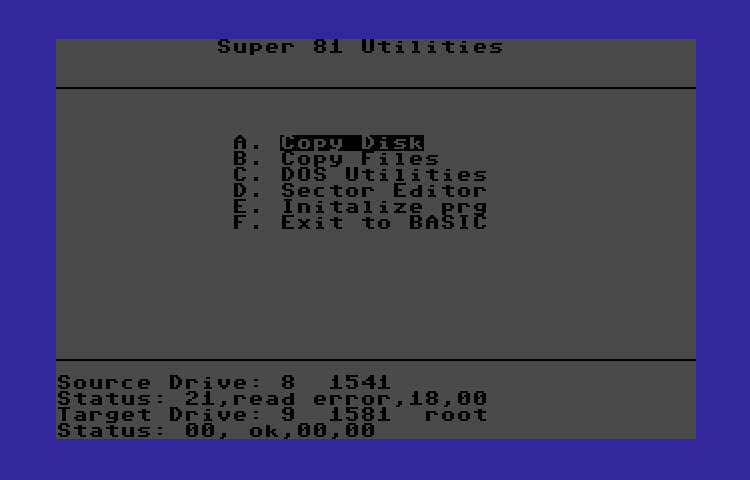 - Copy 1541 or 1571 files to 1581 disks. - Copy 1581 files to 1571 disks. - Backup 1581 disks or files with 1 or 2 1581s. 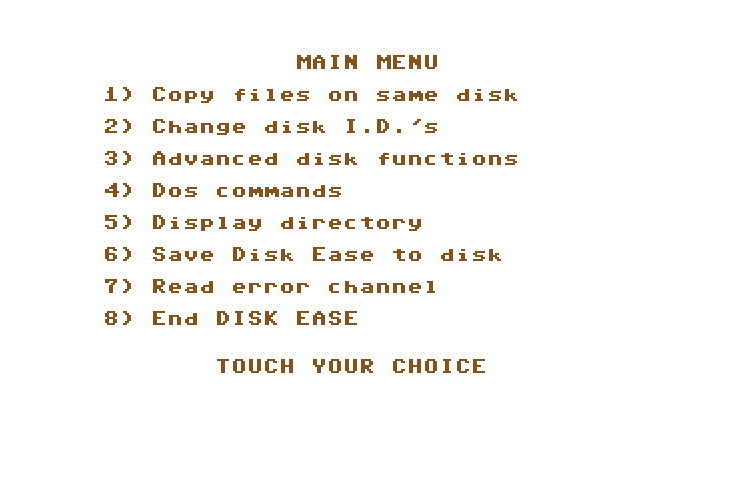 - 1581 Disk Editor, Drive Monitor & RAM Writer. 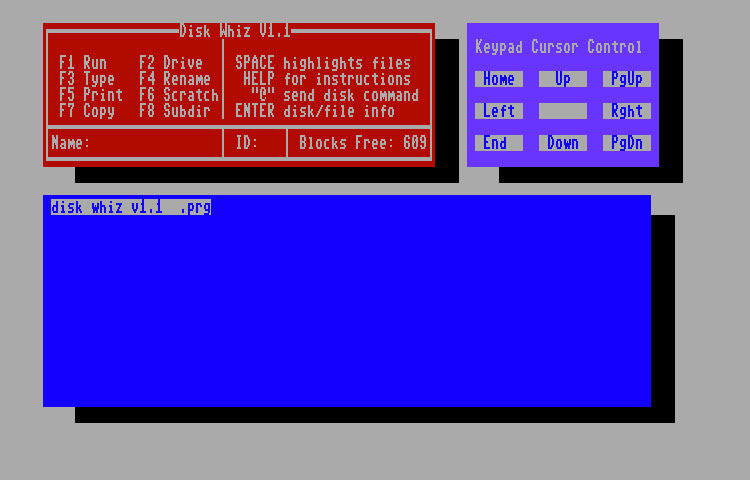 - Perform many CP/M and MS-DOS utility functions. - Complete DOS manager. By T. Shore. Features: View Dir, View load address, Unscratch File, Exam. disc for Errors, Check Disc Blocks, Test all Sectors. 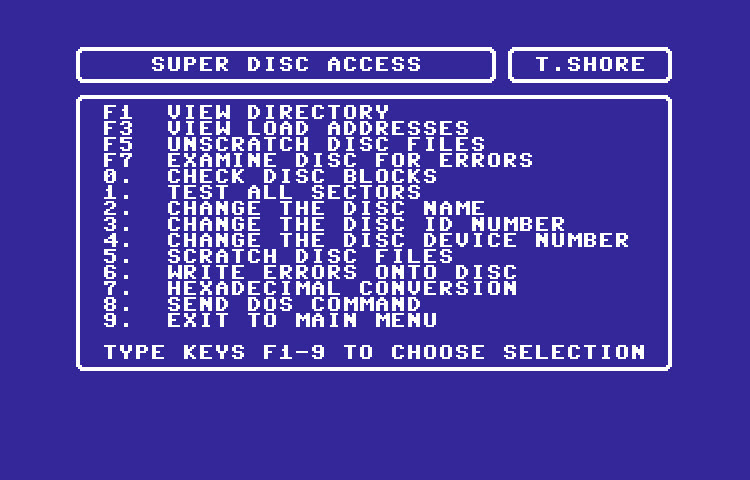 Change Disc Name, Change Disc ID, Change Disc Device, Scratch Files, Write Errors to Disc, Hexadecimal Conversions, Send DOS Command. 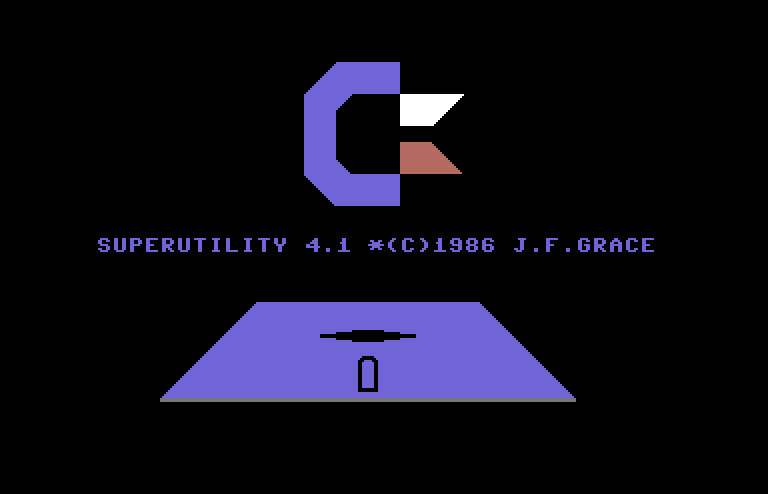 Super Utility 4.1 written in 1986 by J.F. Grace. This handy utility has some really super functions such as creating autobooting files, displaying the block allocation map of a disk and many many more. 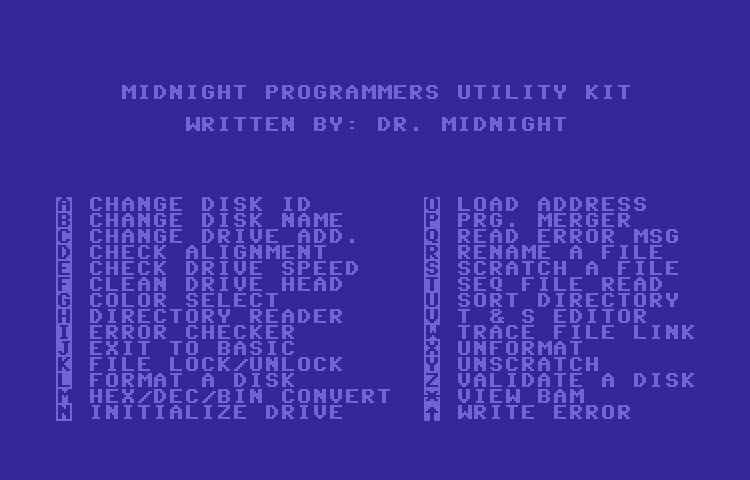 Release in 1985 John H. Kohler - This handy disk utility has many features, such as: Copy tracks/sectors, copy files, scan disk for errors, revive files, block allocation map, find start/end address etc.... a must have for your disk arsenal! Released in 1986 from Strange Mind Software by Don Mayhew. 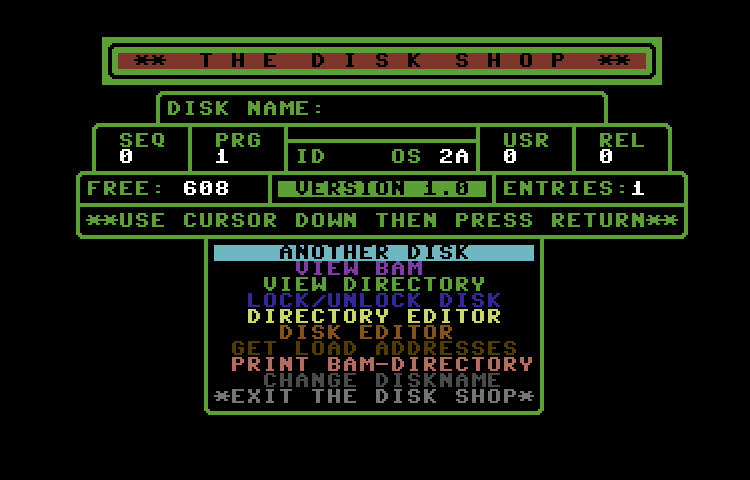 Features - View BAM, Lock/Unlock Disk, Dir Editor, Disk Editor, Get Load Address, Print BAM/Dir, Change Disk Name. 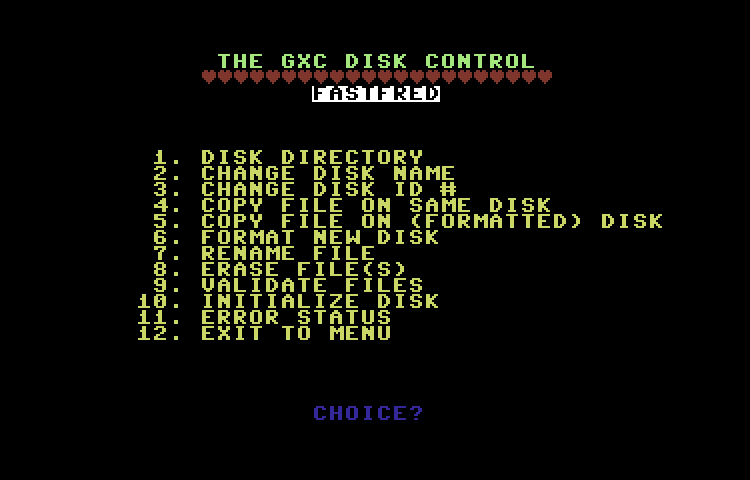 By Fastfred - GXC is a multi-function tool that does everything from grab a disk directory to copying files. It is written entirely in BASIC so might be some good example code in there. Written by Eugene Morgan - Thid handy drive utility has many functions as you can tell by the screen shot, but my two favorite are program start address and bit image directory. Top Secret Stuff by Final Source Software is a huge collection of disk related utilities. See the pictures to get a better idea of what's included. 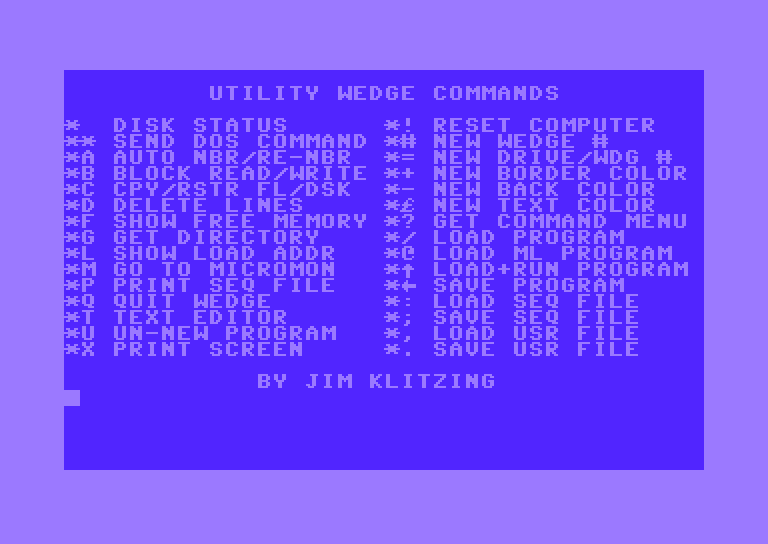 WsDos is a program for the Commodore 128 PC. It provides a way to load and run C64-mode software using the C128's native burst mode protocol. This is done by loading a program while in 128-mode, then switching down to 64-mode where it is started. Installing itself into a seperate bank of memory, the program is protected from being overwritten while in 64 mode. It is also invisible to a suprising amount of C128 software as well. It even survives a CP/M session! I highly recommend checking this out, especially if you don't have JiffyDOS or some other form of fast loading.